understand how places became as they are today, which elements are important and why, and how to protect and manage them. and very individual or site-specific features (bottom-up). 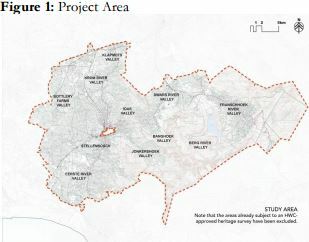 As shown in figure 1, the project area is vast and varied, and is characterised by distinctive wilderness, rural and urban domains. It features rugged mountain ranges and many valleys that have been adapted to settlement in varied forms by many people over long periods of time. The river valleys, from the largest (Eerste River Valley) to the smallest (Ida’s Valley) are typical ‘cultural landscapes’. They are significant because they are economically productive as well as being scenic and tourist resources of great national and international status. 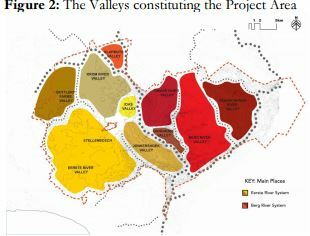 For example, Ida’s Valley was declared a National Heritage Site in 2004, some Municipal areas are part of the proposed Cape Winelands Cultural Landscapes inscribed on the World Heritage Sites tentative list by UNESCO. 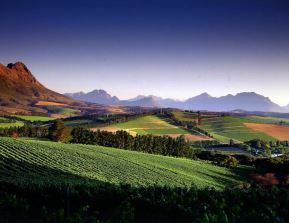 Stellenbosch itself is a renowned tourist destination. Tourism is a critical economic driver that depends on the protection of authentic scenic landscape and townscape qualities. 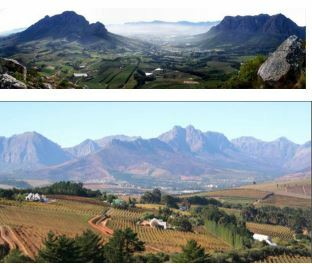 It could be said that heritage characterises most of the Stellenbosch Municipal area. The principals for the project are Fabio Todeschini and Liana Jansen. They bring professional architecture, landscape architecture, city planning, urban design and heritage resources management knowledge and skills. They have both done much work in the Western Cape and in the Stellenbosch area. NHRA: “At the time of the compilation or revision of a town or regional planning scheme or a spatial development plan, or at any other time of its choosing, or at the initiative of a provincial heritage resources authority where in the opinion of a provincial heritage resources authority the need exists, a planning authority shall compile an inventory of the heritage resources which fall within its area of jurisdiction and submit such inventory to the relevant provincial heritage resources authority, which shall list in the heritage register those heritage resources which fulfill the assessment criteria …”. In early 2016 the Stellenbosch Municipality contracted us to prepare an inventory and management plan, so that the municipality complies with the law. In April 2016 we provided a Phase I report entitled “Approach, Concepts, Method and Preliminary Findings”. This document is available to all and can be downloaded from the mentioned Stellenbosch Heritage Foundation website.The next procedure is to prepare a draft Inventory of all heritage resources that currently exist in the Stellenbosch Municipal Area. This will be submitted to Heritage Western Cape (HWC) for approval. Then, all identified Grade II and Grade III heritage resources will be included in the Provincial Heritage Register (Sect. 30). We are also required to submit an inventory of any proposed Grade I heritage resources to the South African Heritage Resources Authority (SAHRA), for their approval. The people who live and work in a place have first-hand knowledge and experience of that area and know where to find people with local memories. We warmly invite your help so that you, and/or your organisation, may make a contribution to this project. Click here to participate in our Heritage Survey. We have already met some of you at six local Focus Group presentations and discussions. If not, please contact us. You will be invited to take part in workshops to be held as the project progresses. Sustainable Futures ZA at: swjohnston@mweb.co.za. We also encourage you to consult the Stellenbosch Heritage Foundation web site to learn more about what is going on in heritage circles, and to register as an interested and affected party. Documents are available there and can be downloaded. Click here to read the article in Xhosa. Click here to read the article in Afrikaans.